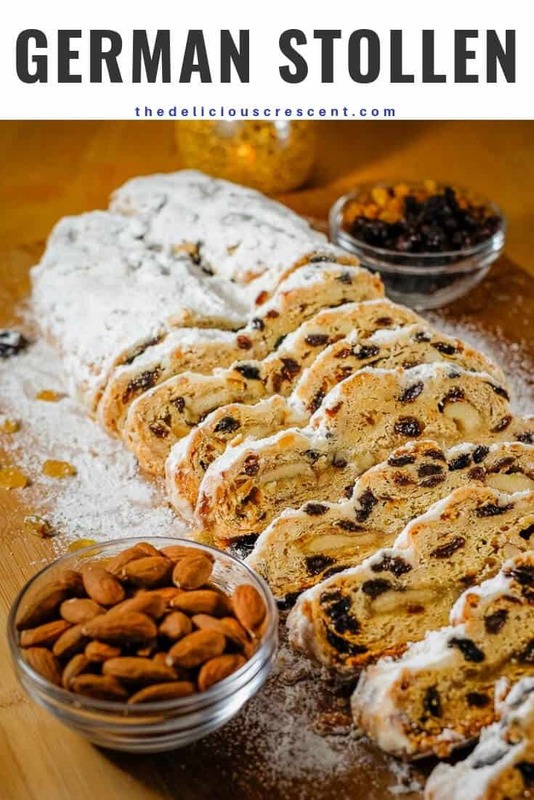 With this classic stollen recipe you can make your own amazingly delicious homemade version of the world famous fruit cake loaded with dried fruit, nuts and spices. This one will absolutely impress your family and friends. Step by step photos at the end of post. 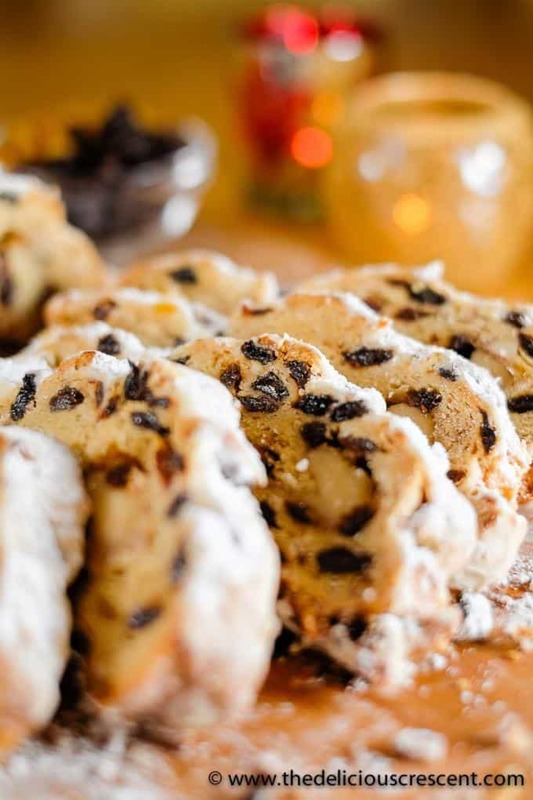 Stollen is a famous yeast based fruit cake from Germany that is quite popular at holiday times. However, holidays or not, stollen is prized for its amazing taste around the world. There are several variations of stollen – Marzipan stollen (with a swirl of marzipan in the middle), Quark stollen (with quark cheese), Mohnstollen (with poppy seeds), Mandelstollen (with more almonds), Dresdner Stollen, Butterstollen (with more butter) and Nuss-stollen (with hazelnuts and other nuts). And Dresdner stollen is the most well known of all. 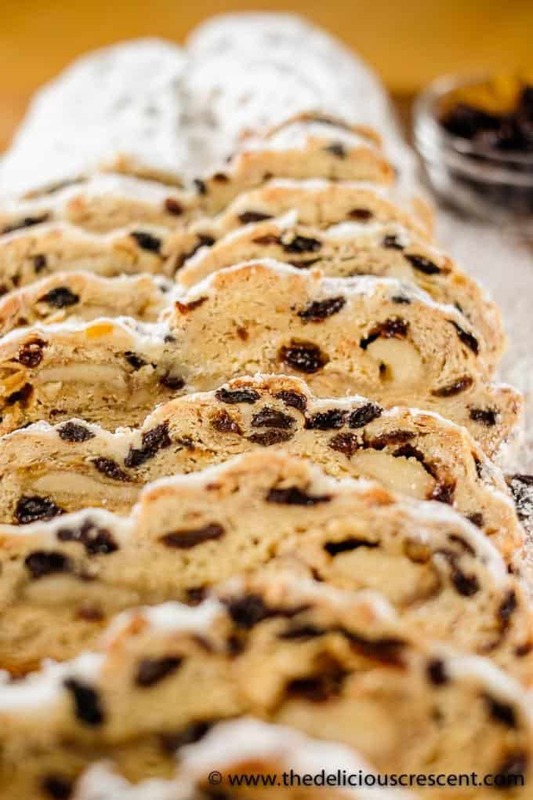 To be labeled as Dresdner stollen, the fruitcake needs to be baked at a bakery in and around Dresdner and the recipe should meet the ingredient specifications. A true Dresdner stollen will have the official seal on it. The ingredients used for Dresdner stollen include yeast, water, flour, butter, sugar, eggs, milk, candied orange peel, candied lemon peel, citrus zest, raisins, almonds, various spices such as cardamom and nutmeg. If you have tried the store bought stollen and love it, I urge you to try this homemade stollen recipe. Most ready-made stollen in the US market are not nearly as tasty as the homemade stollen and you will be thrilled with the results. Promise! If you can bake a cake or bread, then you can easily make a stollen. You just need to pay attention to certain tips and I have you all covered for that! By the way, stollen makes a great gift too! 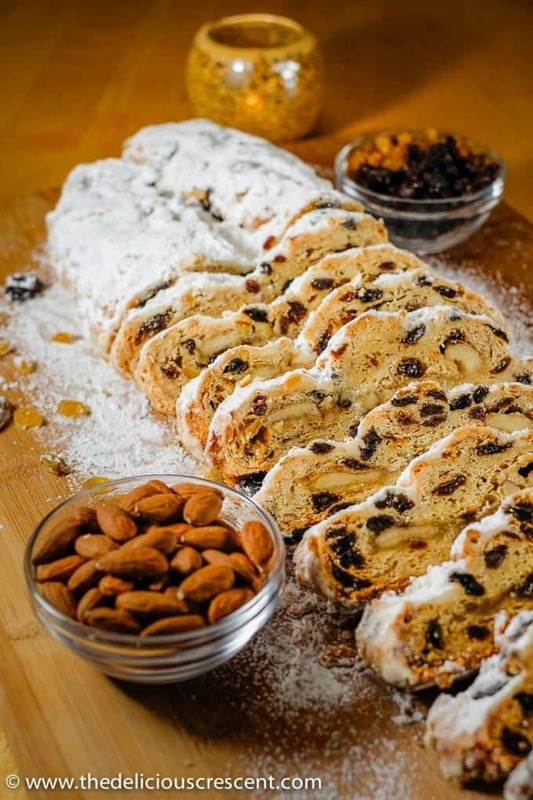 Stollen is a classic holiday treat and as such, you will get the best result using the traditional ingredients which include butter and sugar. However, if you would like to lighten it up, I have some suggestions. Substitute up to half the flour with white whole wheat flour. Alternatively you may just add extra wheat bran. Try substituting 1/3rd of the flour with some rolled oats. Use a combination of equal amounts of light olive oil and brown butter (recipe in notes section of cranberry stollen). If using only light olive oil, then lower the amount of total fat by about 1/3rd. Use only butter or brown butter for the stollen coating as that is important for the characteristic taste of stollen. Preferably use grass fed butter. Sugar in the dough recipe is essential for the texture and richness, but you can lighten up the stollen coating by dusting with fine almond flour alternating with powdered sugar. Be sure to start and end with powdered sugar dusting for the stollen coating. Try dried orange segments and citrus zest instead of candied orange peel. Check this dark chocolate orange slice wheels recipe for how I make my own dried orange segments. Substitute raisins with other dried fruits that are less sweet. Use almond paste instead of marzipan, as almond paste has relatively less sugar and more proportion of almonds. Dairy Free: Use nut milk in place of dairy milk; light olive oil and/or extra virgin coconut oil or trans fat free vegan butter instead of dairy butter. I have not tried this myself, so test it out if you like the flavor and taste. Vegan: Use the above dairy substitutions in addition to egg substitute such as flax eggs. Egg free: Use egg substitute such as flax eggs. Nut Free: Skip the nuts and marzipan or almond paste. You could try using seeds such as pumpkin seeds, but of course, that will give a slightly different taste. 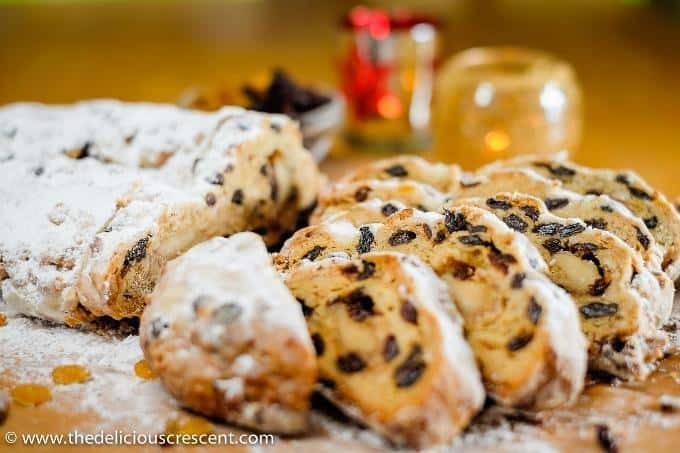 How do you serve Stollen? It is best to wrap the stollen well and let it age for 2 to 4 weeks before serving. This allows the flavors to meld together. 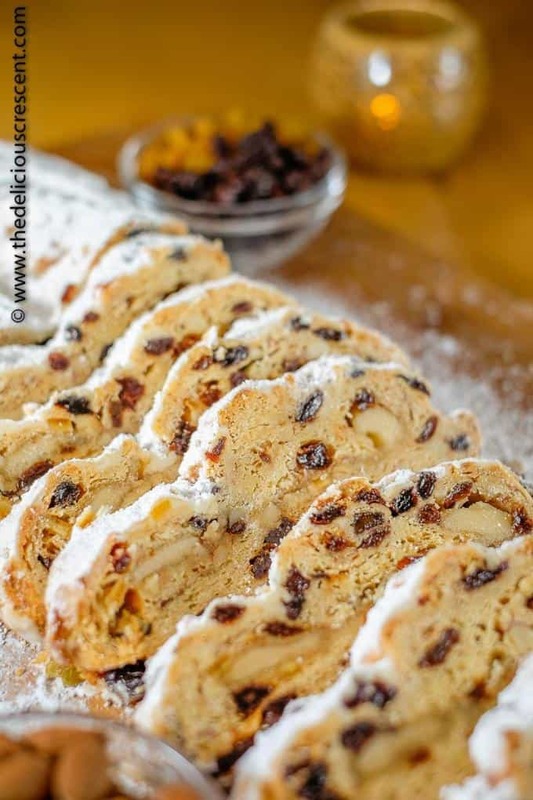 Stollen tastes great with a cup of tea or coffee. Stollen keeps well at room temperature in a bread box or container. But it can also be wrapped well and frozen for a longer period of time. Just let it thaw to room temperature before serving. How long does stollen keep? Wrapped well and stored at room temperature, stollen will keep well for several weeks. You may however choose to refrigerate or freeze it. Just make sure to wrap it well before storing – double wrap in parchment paper, then foil or freezer wrap and then a freezer bag. One of the most important things is to ensure that the yeast dough rises. This dough includes several ingredients that can slow the growth of yeast, so I will share tips to ensure that the dough rises well. Allow the yeast to foam up well before adding other ingredients, to ensure optimal activity. This is an easy recipe, but it requires times. So give sufficient time for the dough to double in bulk in the first rise and also in the second rise after adding the dried fruit. If you don’t let the dough rise properly, the stollen will be more dense than it should be. One trick I use sometimes, is to place the dough in an oven that has not been preheated and with a pan of hot water one level below the container/baking sheet. This will help the dough rise better. Do not keep the hot water too close to the dough. Commercial almond paste has a higher percentage of almonds and lower percentage of sugar as compared to marzipan. But it does not have the characteristic rose water added to marzipan. If using almond paste, then add some rose water if you prefer. I prefer to use brown butter for the stollen coating, as it gives an extra nice flavor. To prepare brown butter, melt unsalted butter and simmer at a low setting. Let the milk solids settled at the bottom of the pan to toast to a light brown. 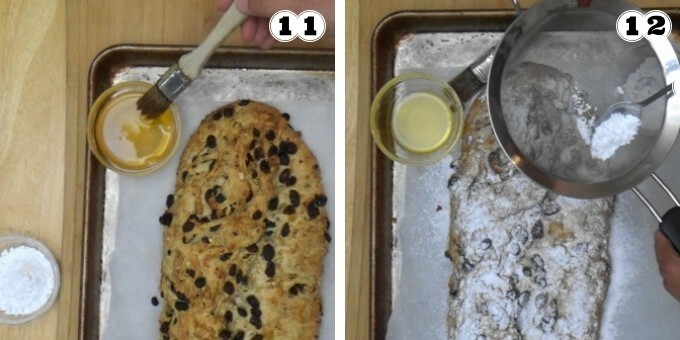 For this stollen recipe, strain the light golden liquid from the top and use. Traditionally the dried fruits are soaked overnight in rum. I do not use rum, so I have used orange juice instead. One possibility is to use a combination of orange juice and non-alcoholic rum extract. Metric measures are more accurate for baking. If using cup measures, make sure to unpack the flour and spoon it into the measuring cup. The swirl of marzipan (or almond paste) actually keeps the stollen moist. The coating on top of the stollen keeps it moist. Make it ahead, wrap it well and let it age for 2 to 4 weeks before serving. This allows the stollen to develop its optimal flavor and texture. In the mixing bowl take warm milk and sprinkle the yeast over it. Then scatter couple teaspoons sugar on the top. Allow it to stand in a warm dark place for about 10 to 15 minutes until the yeast foams up on the surface. Sift the flour into the bowl. Then add sugar, butter, egg, vanilla, salt, anise, cardamom and nutmeg. Combine all the ingredients together. 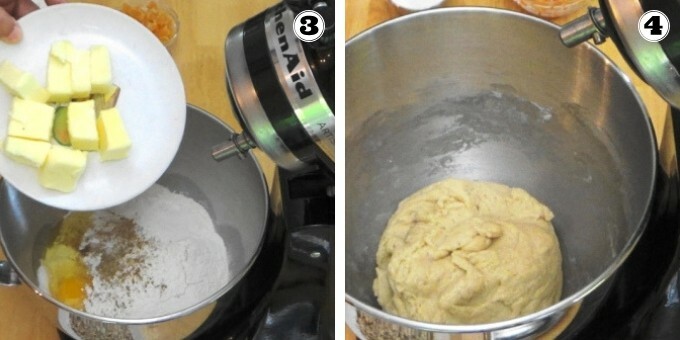 Knead it well for about 5 minutes using a stand mixer or by hand.Tip: For stand mixer use the dough hook and start the kneading process at low setting initially and advance to the higher setting and knead for 5 minutes. Cover the dough and let it rise to double in bulk. This may take time. And it may vary between 1 to 2 hours or more. Make sure to give it time to rise nicely. This rich dough may benefit from additional boosters to help it rise. Check out my tips in the "Notes" section below. Take the marzipan and press it with your fingers to flatten it a bit. Using a rolling pin, roll it out into a 12 x 6 inch sheet. On a lightly floured work surface, roll out the stollen dough into a 12 X 8 inch rectangle, using as little flour as possible. 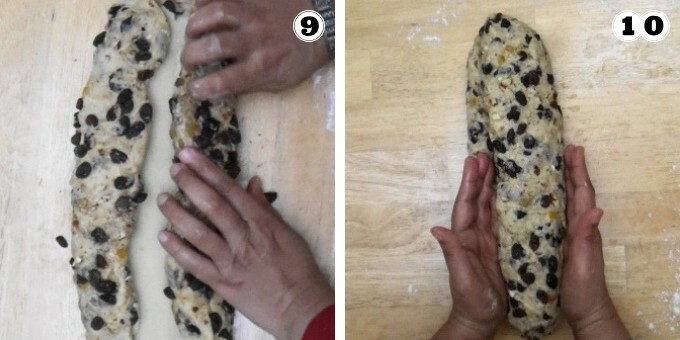 Next, place the marzipan sheet over the rolled out stollen dough, leaving a one inch border on the long sides of the rectangle. 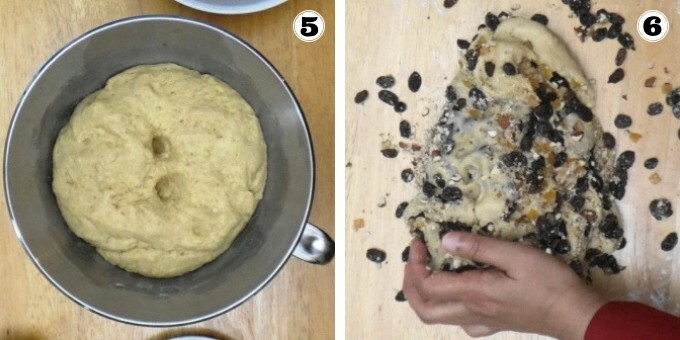 Make sure to seal the edges well and shape it into a stollen. Carefully transfer the classic German stollen onto a baking sheet lined with a parchment paper. Allow the Stollen to rise very well. It may take 30 minutes to an hour for the second rise. (Make sure to check the tips in the notes section). Lower the oven temperature to 325 degrees F. Once the Stollen has risen well, bake it for about 45 to 55 minutes until it is nicely brown. When it is completely cooled off, wrap the stollen twice with baking paper or cling wrap and then in foil and store for at least 2 weeks or more before slicing and serving. 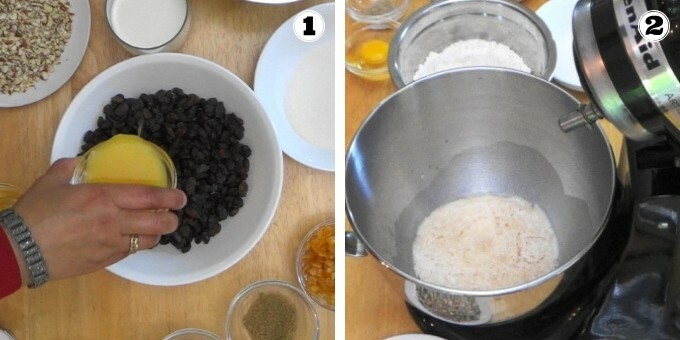 Soak the raisins overnight. Let the yeast bubble up in warm milk. Add all the dough ingredients in the mixing bowl. Combine and knead it in a stand mixer or by hand. Let the dough rise to double in bulk. Add the dried fruit, almonds and candied peel and knead it into the dough. 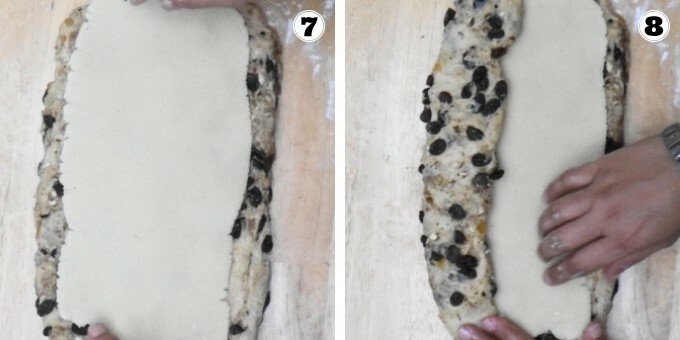 Roll the marzipan into a sheet and lay it on the rolled out stollen dough. Fold the dough over the marzipan from one side. From the other side fold over the stollen dough and make another fold and bring it all to the other side and shape it into a stollen with a hump in the middle. Then bake it in the oven. Brush melted butter over stollen straight out of the oven and dust with powdered sugar. Repeat this a few times. I have a question – how would you describe the texture of this stollen? I’ve made stollen twice before (using different recipes), but they were both dry and quite stale – even though I only aged one. Im looking for something cheqy and sweet, like in the bakeries. Will this fit the bill? Hi Rhoda. I have baked this several times for many years and tried what my German mother in law made at home often. And, yes, it is absolutely very good – the way it is supposed to be – if the recipe is followed carefully it will be like that. Better than any store bought I tried in the US and like some of the best ready-made ones I tried in Germany. I would use the marzipan or almond paste inside, helps with keeping it moist. And would always wrap it well and store well. When shaping the Stollen I would roll the dough in a way to maximize the height, because it will flatten while letting it rise and bake. It is plenty sweet. Didnt understand cheqy? Typo?